A baker’s cyst is also known as popliteal cyst because they usually develop at the posterior part (back) of the knee. 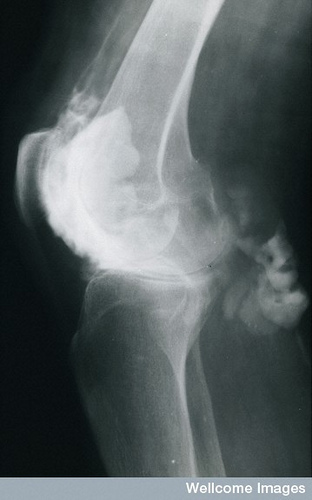 They are typically formed when synovial fluid accumulates in a bursa or sac at the posterior part (back) of the knee. Rather being a disease, baker’s cyst actually signifies an underlying medical condition. The condition is common in adults between 30 and 70 years of age. Sometimes, the cyst is not painful but if it gets too big, it can cause pain at the posterior part (back) of the knee upon movement. Other symptoms include tightness and swelling at the posterior part (back) of the knee. There is limitation of motion of the knee joint due to bulging and pain. Motion can be stiff especially when bending the knee. If the cyst ruptures, it can cause excruciating pain, inflammation and bruising on the popliteal area. The pain can possibly extend to the calf area as well. Baker’s cysts usually resolve on their own. To manage pain and swelling, apply ice pack at the posterior part (back) of the knee. Make sure not to press too much since it can cause additional pain to the area. Pain can be treated by NSAIDs or cortisone injections. In addition, bracing may also be recommended if there is difficulty in walking or weakness in the associated parts. Another option is to visit your doctor and have the cyst removed. The doctor will insert a syringe at the posterior part (back) of the knee to aspirate and drain the fluid. Since baker’s cyst usually occurs in conjunction with other orthopedic condition, it would be best to undergo MRI or ultrasound examination to determine the primary condition of your knee. If baker’s cyst occurred on its own, there is no need for further treatment. However, if there are existing medical condition, then the primary cause should be treated in order to get rid of baker’s cyst permanently. Physical therapy can help heal any underlying musculo-skeletal conditions and the popliteal cyst as well. Treatment includes cryotherapy, strengthening exercises, range of motion exercises, modalities and crutch training (if ambulatory aid is needed). A baker’s cyst, especially when it ruptures, can be mistaken for deep venous thrombosis or a blood clot. It also presents with pain and swelling in the calf region. Sometimes, baker’s cyst can also be mistaken for a tumor. To diagnose the condition accurately, doctors request for diagnostic services such as magnetic resonance imaging (MRI), knee x-ray or ultrasound.